Cloud Computing -- The Solution and the Problem for Genealogy? I have transitioned from using a laptop to using an iPad Pro computer that is basically a connection to the internet. Current news reports indicate that Apple's sales of desktop, iMac, computers during Quarter 2, 2016 are down for the first time in years. Intel announces it will layoff 12,000 jobs globally in 2016 and 2017. The workforce reduction is attributed to the fact that most of Intel's microprocessors and chips are sold in the PC market. Intel intends to move into mobile chip support and gaming. In addition, home broadband use has declined recently and the declined is attributed to increased reliance on smartphone connections to the Internet at the expense of home-based broadband. Recent Pew Research Center Studies indicate that cell phone usage among those 18 to 29 years of age has reached 85%. During the time I was deciding whether to transition to an iPad Pro or buy another MacBook Pro, I read and studied the trends. As I have previously written I also went through every program on my MacBook Pro and determined exactly how I was using the program and whether or not the iPad Pro could do the same things. The reviews of the iPad Pro focus on the things it "cannot" do rather than the things that it can do. If, as the news and research studies show, people are beginning to transition from home broadband Internet connections to using their smartphones, such as the iPhone, then it must be the case that the smartphones perform enough of the functions of a desktop computer to erode the sales of desktops. The sales figures support this view. What does this mean for genealogy? It means that unless the genealogy companies begin more aggressively to move into the mobile market and support all of the functions they deem important by online apps or programs, they will ultimately be marginalized. When I say ultimately, I mean within a year or two, you will see real changes. Now if you are sitting and reading this on your old PC or Mac computer that is sitting on a desk, then you are now in the distinct minority. 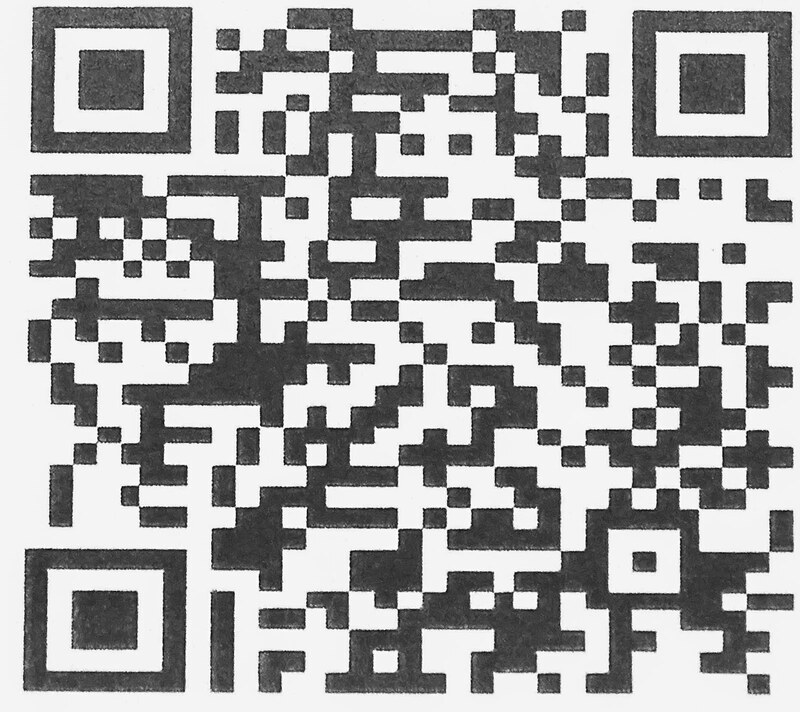 If on the other hand, you are reading this on an iPad, Android tablet or smartphone, you are part of the trend. One interesting aspect of this transition is that I had the option of buying a laptop such as one of the new MacBooks and docking it with a large monitor and some hard drives. Essentially, I could then have a single computer rather than an iMac and an iPad Pro. For the time being, I have opted to retain my iMac and upgrade it at least one more time, but I may well move to a laptop only at some point or an iPad only if they evolve even more than they have already. There is nothing that the average genealogist does on a computer that cannot be done on a laptop and there are very few things that any genealogist does that cannot be done on an iPad Pro or a Microsoft Surface 4. The key to this transition is that most of the programs that used to reside on a local, desktop computer have now moved online, to the cloud so to speak, and there is no need for the local machine to be desk-bound. Let me take one example. I use word processing more than any other single function on the computer. For years, I have used Word Perfect and now Microsoft Word. I also use spreadsheets in Excel and I do a lot of PowerPoint presentations. I have now moved to Apple's Keynote for making presentations. I have Keynote on my iPad Pro and it works just fine. The main issue is inserting graphics and I have mostly solved that problem by moving my graphics to the cloud. I can also buy Microsoft Office for the iPad Pro. Issue resolved. Why do I still need a desktop computer? I still do a significant amount of high-end, graphic intensive editing and photo manipulation using multiple programs. This is where the mobile computers still cannot compete. But if you do not use Adobe Lightroom or Photoshop extensively, you probably will never run into this particular problem. I also have over 3.5 Terrabytes of data and it is not convenient to use a laptop or iPad because they do not have the ports to connect to all my hard drives, scanners and etc., so until that issue is resolved, I will still need to return to a desktop iMac. One final example, we now have a WiFi enabled HP printer. I can print from my iPhone or my iPad Pro directly without a wire connection. In fact, I can print from anywhere I have a WiFi connection to my own printer. There is no end to this story. From time to time I have written about the sad state of history education in the United States and its impact on genealogists' understanding of their ancestors. I thought I might discuss some dates that are particularly important to genealogical research. I might also throw in some observations on the type of errors I commonly encounter because researchers do not correlate the historical dates with what they are putting into online family trees. Surprisingly there aren't that many crucial dates, but they are so often ignored that, for me, looking at the family trees online is like living in a pesky swarm of mosquitos. Here are the dates in a roughly chronological order with a discussion of the importance of the date and what kinds of problems I usually encounter. This is the date calculated by Archbishop James Ussher in the 17th Century. If you would like to see how he calculated this date, you can read an extensive analysis the Conservapedia.com: Date of creation. I am more than aware of the various controversies that surround this date and the religious fervor the various positions engender, but genealogists really shouldn't be worried about extending their pedigrees "back to Adam." There is no benefit that accrues from spending the time copying one or more of the unsupported genealogies into your own records whether you believe the date and the religious justification for the date or not. If you want to see my summary of the issue then you can view my YouTube.com video entitled, "Why You Can't Trace Your Lineage Back to Adam." Following up on the "Back to Adam" issue is the significant date of 1500 AD. This date is a rough approximation of the earliest time during which records of ordinary people would have been kept in Europe. There are a very, very few records that go back further, but most of the records that have genealogical significance are not available before this date. Whenever I make this statement, I always have some that argue that "they have found more information about their family that goes back even further than this date." With a few notable exceptions, these people are merely copying from books published long after this date giving various pedigrees for kings and other prominent historical figures. Almost uniformly, these "older pedigrees" are based on undocumented and unsupported extensions. There are some "proven" pedigrees that purport to extend the royal ancestry of immigrants to America, for example, but so what? When you begin copying, you are no longer doing genealogical research. If it makes you feel important or whatever to connect to European royalty, then go for it. But don't think you are impressing me or anyone who knows anything about these pedigrees. I admire those who have the historical background, language skills and dedication to do Medieval research, but I have only met a small handful of these people in my entire life and they are certainly not the folks putting their family trees online. Note, there are a number of places in the world, such as China, where family records and pedigrees go back much further than 1500 AD. I might also mention that there are a few older parish records from Spain, but for most of Europe, this is about the limit. This is the date that is commonly accepted as the beginning of the keeping of English parish records. If you have any questions at all about this date and want to show me how you got a baptismal record for you ancestor before this date, I would be glad to review it. Here is a book to get you started with your investigations in this area. If you don't know this history, you have no business adding content to online family trees. Keep your poor research and speculations to yourself. Cox, Charles. The Parish Registers of England, by J. Charles Cox,... London: Methuen, 1910. You can read a very nice, digitized copy of this book on the Archive.org website at https://archive.org/details/parishregisterso00coxjuoft. There are extensive references concerning the earliest records that have been located for each of the English parishes. Meanwhile, as soon as FamilySearch.org fixes the Family Tree and disconnects it from new.FamilySearch.org, I will be editing out all of the unsupported dates in all of my family lines. This is the date of the arrival of the Mayflower in America, although some European settlements, especially those initiated by Spain, go back to the original time of Columbus. Arguments about earlier European settlements in America have an academic interest but not for genealogists. This is the range of dates when the first European settlers entered the area now segmented into the states of the United States of America. Every state and every county in the United States has a date when the first European (or whatever) settlers first entered that portion of the country. Usually referred to as the date of earliest settlement, these dates are commonly ignored by people who locate their ancestors in parts of the country that were not settled at that time. I ran across a reference to one of my ancestors who was supposed to have been born in Utah in the 1700s. This is a really common error. There are lists of the time of formation of every state and every county, try the Newberry Atlas of Historical County Boundaries for a start. Obviously this issue blends into the date calculations that seem to show children born before their parents and after their parents died. But I see all of this as a symptom of the same problem; a total lack of awareness of history and dates. Before any of us can take seriously much of what passes as genealogical research, we will have to clean up the mess caused by this gross ignorance of history. I could go on with dates such as the dates for the U.S. Civil war, and many others but I think this list gives an idea of the process we should all be aware of when we start putting our research online. As we go back in time, there is a point when vital records for ordinary people were neither required nor kept. Thus, a greater depth of knowledge is required to retrieve the desired information from the records. This book contains an overview of vital records, a step-by-step guide to marriage records in their various forms, a review of the laws that govern legality of marriage, regulations regarding birth records and delayed registrations, and diverse strategies for locating hard-to-find evidence in the records. You will enjoy this approach to the resources as we take you from common and easily found records to unusual and more difficult-to-find resources that yield vital information for your family history research. The Vital Records book joins this list of previously published books on Amazon.com. Hansen, Holly T., Arlene H. Eakle, and James L. Tanner. 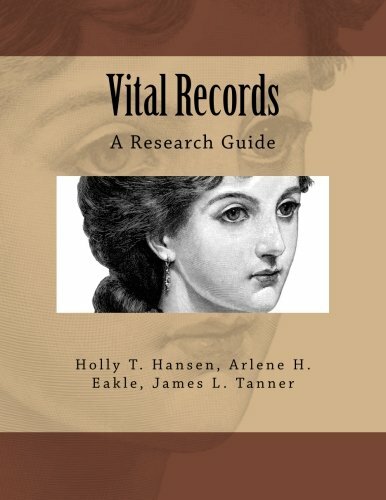 Vital Records: Research Guide. CreateSpace Independent Publishing Platform, 2016. By an interesting set of circumstances, my wife and I now find ourselves very much involved in the Brigham Young University, Harold B. Lee Library Family History Library in Provo, Utah. I began to wonder about the Library, particularly because I was also frequently visiting the renowned Family History Library in Salt Lake City, Utah. For those of you who are not well acquainted with Utah, Salt Lake City is located in the northern part of the state along the western edge of the Wasatch Mountains. The Wasatch Mountains run north and south and western edge of the mountains forms a dramatic ridge line called the Wasatch Front. Along this western edge, for about 150 miles, there are a number of valleys which were settled when the Mormon Pioneers entered the area beginning in 1847. The population of the Salt Lake Valley dominates the area. But the Salt Lake City, UT Metropolitan Statistical Area, which includes all of the smaller communities in the Salt Lake Valley, is ranked as the 48th largest in the nation. Provo, Utah, where I live, is located in Utah Valley, the next larger valley to south of Salt Lake City. For comparison, we moved from the Phoenix-Mesa-Scottsdale, AZ Metropolitan Area which is ranked number 12 in the nation. The Provo-Orem, UT Metropolitan Statistical Area is ranked number 93 in the nation. But the Provo area has a larger population than other more prominent towns such as Spokane, Washington and is about the same size as Augusta, Georgia. From our perspective we moved from the big city to the country. However in Mesa, Arizona where we used to live, we were only about a five to ten minutes' drive from the edge of the city and the open desert. In Provo we live across the street from the National Forest Boundary. Both the Family History Library in Salt Lake City, Utah and the Brigham Young University Family History Library in Provo, Utah are operated by The Church of Jesus Christ of Latter-day Saints. For many years now, the Family History Library in Salt Lake City, Utah has been acknowledged as the largest such facility in the world. The collection includes over 2.4 million rolls of microfilmed genealogical records; 727,000 microfiche; 356,000 books, serials, and other formats; over 4,500 periodicals and 3,725 electronic resources. As I began to compare the two libraries, I wrote about my opinion that the BYU Family History Library was the second largest family history library in the world. Recently, I read several references that seemed to reinforce that opinion. At number 29, the BYU Harold B. Lee Library is ranked among the top 50 university libraries in the United States by CollegeRank.net putting it above many other very prominent universities. I found that in 2012, the Harold B. Lee Library had been ranked number three in the nation after Harvard and Columbia in the Princeton Review. The Princeton Review currently ranks the library as number 19 in the nation. I also found that the Harold B. Lee Library had been ranked number 1 in 2004 and number 4 in 2007. It has become clear to me that I have ended up working in a world class library. But what I found interesting is that in the larger genealogical community and even here in Provo, the BYU Family History Library and the Harold B. Lee Library itself are relatively unknown and vastly underused. It is probably important to point out that the BYU Family History Library is part of the university. It is not a FamilySearch Center or FamilySearch Library. It is maintained, operated and staffed by BYU employees. There are approximately 130 Church Service Missionaries that voluntarily staff the Family History Library in addition to the employees. My wife and I are two of those 130 missionaries. The main objective of the library is to support the student population and we certainly do that. But we also have a definite outreach to the community, state and the world. One example of the Library's efforts to extend its reach is the current series of online, live webinars. These presentations have been ongoing for some time now and the recorded sessions are being posted regularly to the BYU Family History Library YouTube Channel. One recent video gave a pretty good view of the part of the Library where we work. This overview begins to explain why I maintain that by being part of this world-class library, it enables the Family History Library to be the second largest such facility in the world. As I continue digging deeper and deeper into the possibilities of DNA testing as a tool for determining genealogical relationships. It occurs to me that before any testing can be done, there is a need to define one or more specific genealogical issues that could be resolved. At this stage of my investigations and reading, I am not overly impresses with the accuracy of the various companies. It appears that lacking a very specific investigative target, a general DNA test is more of shotgun approach than a well-aimed single shot and as anyone who has shot a shotgun knows, the cluster disbursement of pellets increases with the distance of the target. Family Finder matches are other individuals in our database who have also taken the Family Finder test and who, through autosomal DNA comparison, are found to share a common ancestor with you from ANY of your ancestral lines within the past five generations. The names and emails of your matches, an estimate of how closely related they are to you, and any genealogical information they have uploaded are provided to you in order to collaborate on genealogy and get past genealogical brick walls. From my standpoint the key statement here is "ancestral lines within the past five generations." Why does this statement mean anything to me? I have extensively documented all of my family lines for at least six generations. This information is readily available online and from time to time, I connect with people who are related or possibly related back more than six generations. My least documented lines begin having issues only in the seventh and eighth generations. So, if you are doing your own research, and you have a family tree on MyHeritage.com, Ancestry.com or FamilySearch.org, you can readily determine whether or not we are related, without a DNA test, by simply looking at the matches or doing some descendancy research. Further there is absolutely no controversy over the origin of any of these six generation ancestors. Positive, documented, birth information has been found and is provided online. There is one sole exception to this statement: my Great-grandfather, Marinus Christensen. As I have written previously, Marinus Christensen, (b. 1863, d. 1927) from Denmark, is persistently characterized in family stories as "adopted." Marinus was one of the three children of Jens Christensen and Karen Marie Johannesen. So far, my paper research has not resolved this issue. So the question is, can DNA testing be of any help in resolving the question of adoption. You would probably, if you have been to some DNA presentations, say why yes, of course. But let define the problem with more specificity. My father is a descendant of one of the two Christensen daughters on his mother's side. This means that neither he (nor I) inherited any Y-Chromosomes from the Christensen males. My father's mother's mother was the daughter of Jens Christensen. On my own mother's side of the family, her mother was the daughter of Marinus Christensen. So I have no Christensen Y-Chromosomes at all. As a matter of fact, my only ancestral connection with Denmark is entirely through female lines. My father's mother was the daughter of Henry Overson, whose father, Ove Christian Ovesen (or Oveson) came from Denmark and married Jens Christensen's daughter. So I have no Y-Chromosomes from that line either. Now here are the possibilities. Absent any possibility of my having a Y-Chromosome, which DNA test would resolve this issue? Resolution of this issue essentially determines if my parents were second cousins or unrelated. Bear in mind, that there are no known male descendants of Jens Christensen except Marinus. Now that is one of the exact questions I am writing about when I say that a specific genealogical issues needs to be identified and defined in a way that can be resolved with DNA testing. Absent this why would I want to know generally where my family came from? What would I learn if a DNA test, if it were at all possible, told me I had Danish Ancestors? By the way every one of my documented lines, with the exception of these two Danish families, come from England, Scotland, Wales or Ireland. The earliest continental European ancestors are 10 generations back and may have come from the Netherlands. But since, I have documentation verified only about six or seven generations back on every family, I would have to leave open the possibility that there is another line somewhere out there from the continent. Would a DNA test help me at this time? To invite the general public to join this real-time scientific project and to learn about their own deep ancestry by purchasing a Genographic Project Participation and DNA Ancestry Kit. The testing partner for the Genegraphic Project is FamilyTreeDNA.com. These videos give a short, introduction to these two related companies. I have a rule when I am reading a non-fiction book. If I come to a statement or conclusion that I know to be inaccurate or incorrect, I immediately begin questioning the reliability of the entire book. I was recently reading about about the technological changes in libraries around the world and the author, who was supposed to be a noted authority on the subject, made a statement that showed he did not understand some of most basic features of the new technology. That kind of problem ruins the book for me. If it looks like the problem is just poor editing, then I keep reading, but if I see the same problems occurring I stop reading the book. Essentially, if I can spot errors from what I know, how will I spot errors in the parts I am not so familiar with? After 39 years of trial practice as a lawyer, I also assume that people treat me the same way I treat non-fiction books. Now we find ourselves surrounded by a huge international genealogical community. Substantial parts of that community consist of people with only the most casual and superficial interest in genealogical research. They are easily satisfied with a few facts about their "relatives" or ancestors and have no intention of pursuing any research. This group would be surprised that anyone would consider them to be genealogists. At the other end of the spectrum, we have professionals who spend the most of their time in intensive, detailed research into original source documents and fuss about the details of formatting entries. How do we reconcile this disparity? Out of this huge mishmash of data do we determine what is and what is not reliable? Unfortunately my rule regarding non-fiction books is of little help to me in evaluating genealogical research. Of course I can detect blatant errors such as mothers whose children were born after she is reported to have died, but how do you detect less obvious, unreliable genealogical conclusions? More importantly, that same entry with the obvious data error may otherwise be perfectly reliable. Presently my only conclusion is to redo the research and come to my own conclusions. To take this position I have to begin with the assumption that every undocumented assertion is questionable. Then if the documented assertions are reasonable and consistent, I can then decide whether or not I will adopt them and rely on them after I have reviewed the documentation. The basic flaw in such schemes as the "Genealogical Proof Standard" is that if the researcher gives, what appears to be, complete, accurate source citation for each conclusion and writes a report that seems to comply with the standard, then you are still in the situation of relying on the researcher's integrity. Despite the adherence to formalities and despite reputation, from my standpoint, I would have to personally verify the conclusions. All of the citations and "arguments will merely make my job harder or easier depending on the availability of the sources cited. However it is the nature of historical research that two or more researchers can look at the same source documentation and come to completely opposite conclusions. Even if the entire genealogical community is in agreement on a particular issue, subsequent research may disclose differences. See the Thomas Jefferson controversy for example in the following book. The important issue here is that the source citations and documentation exist so the conclusions can be checked. When I become disenchanted with a book, it is usually because there is a lack of documentation for the conclusions expressed. In the case of the example above, there was no evidence that the writer had based his statements on any cited authority. If the author or researcher is expressing an opinion, derived from experience or contemplation, that is fine. But if you tell me that your opinion on a historical or genealogical question is a "fact" and that the fact is proved by some source, you had better tell me your source. If I enter information into a pedigree or family group record for my own reference and continued research, then what I have is my own business. But if I take that same information and add it to an open online family tree, then the information become everyone's business. Individual records from the distant past to the present, are essentially claiming to be correct. Even leaving aside the issue of intentional fabrication or lying, original records are assumed to be correct unless contradicted by other records. For example if I find a birth certificate for my grandfather, I am justified in assuming the date recorded is correct unless I find another document that contradicts that same information. If I further assume that I have found five different records that have a birth date for my grandfather and none of the five agree with any of the others, then I must either approximate the date or choose the one I think is correct. In either case I need to show all five records with the five different dates in the explanation for my conclusion. The case where a given date or event has contradicting source records is fairly common. As long as subsequent researchers are provided with the contradicting information, there is no problem. The actual date is still unknown or unsupported. Even if an immensely knowledgeable researcher were to follow all of the recommended guidelines for "proving his or her conclusions," the bottom line is that the conclusions are nothing more than a vaulted opinion. One example of what I saying comes from a situation I wrote about previously. My Parkinson family line initially had a long list of sources for more recent ancestors. However, despite the long list and the apparent detail of the entries in the FamilySearch.org Family Tree, there were no sources cited for any births, deaths or marriages. The citations demonstrated more than adequately that the family lived in Utah but there was not one citation showing their origins in England. The challenge we face, when you analyze all the factors involved, is that we can only make progress in finding our ancestors with any chance of reliability by carefully drawing our conclusions from the existing historical records. Once the information has moved into our "comfort zone" we can then extend our lines even further. But like the situation when I am navigating around an unfamiliar neighborhood, there is always the chance, despite using GPS and maps, that I will take a wrong turn. Likewise there are many wrong turns in genealogy. I have been wondering about allocating time to do all the webinars and at the same time keep blogging. Some of the presentations take more than an entire day's work. The Brigham Young University Family History Library has uploaded five new videos in the last week on its YouTube Channel. Here are the latest offerings. There are a lot more planned for the near future. The schedule for May, 2016 ought to be online soon. See the BYU Family History webpage for a link to the classes, webinars and YouTube.com videos. Check the link in the upper right-hand corner of the screen. As I have been mentioning recently, I am investigating the relationship of DNA to genealogical research. There is no doubt that some very prickly research issues can be resolved or measurably addressed by DNA testing. But so far, I am still very much of the opinion that without more than adequate and serious "paper" research, DNA testing is little more than a novelty. Learning that I have a certain possible percentage of relationship to a particular haplogroup may incentivize me to do some research, but otherwise, personally, I don't see the point. Now by saying that, some will immediately become defensive and be compelled to relate how their personal DNA test changed their entire life and challenged their live view, but even if I were to take several DNA tests, I would not be expecting to obtain any particularly useful information absent some specifically designed and documented problem that was being addressed. I can't keep from making analogies to other areas of my experience. Most people in the United States either own a car or use public transportation of some kind. However I am sure that very, very few people who are traveling around on the freeways today could explain the inner workings of an internal combustion engine. This lack of understanding about the internal workings of their cars' engines does not stop them at all from driving around. I am also aware that many people do not understand even simple concepts such as "miles per gallon of gas" or whatever. This does not stop them from using the machines for productive purposes. The same things could be said about computers. In fact the time when computers were being introduced is a great analogy to the present state of DNA. When I first began selling computers back in 1982, we spent a lot of time explaining to people "how they worked." We were all caught up in bits and bytes and RAM and other technical stuff. Granted, today, you might still need to be generally aware of some of the specifications of your computer, but how many of us really care what processor it has? The idea here is that DNA is in the "explain everything in technical terms stage." But what most people want to know is what they are going to get for their money. For example, let's suppose that I find out that I have certain percentage of Scandinavian genetic material, how does that help me read old Norwegian parish registers? Oh, but you say, I am missing the point. No I am not missing the point. If I have documented ancestral relationships to England, I do not need a DNA test to tell me my ancestors came from England. But as I have mentioned in previous posts, there are certain problems that are apparently possible to solve with DNA research assuming I can get the right relatives to agree to be involved in the test process. For some time now, I have been aware of the International Society of Genetic Genealogy Wiki. Rather than listing a lot of references, I will refer you to the ISOGG Wiki. There are plenty of links to articles galore about genealogy and genetics. But even here, there is a compulsion to explain in beginning terms, the inner genetic workings of DNA testing. Here is a list of some of general questions DNA testing is supposed to address taken from a post on the Wheaton Surname Resources entitled, "Beginners Guide to Genetic Genealogy." Some of these are laudable goals, but some of them are only possible given my initial assessment of extensive research and the cooperation of the right relatives. I guess my wrap up question is how consistent would DNA testing be across different companies? I have been hearing reports of people that have taken several tests and gotten disparate results. This post is being written on an iPad Pro with the 12.9 inch display. I spent about 3 months (off and on in between everything else) researching whether or not I wanted to replace my MacBook Pro laptop with the iPad Pro. I went through every program (app) on my MacBook Pro, one by one, and analyzed how I used the programs and how they would function on the iPad Pro (or not). I have been using a variety of laptops computers, both Apple and Windows, for years. I would characterize most of them as "luggable" rather than actually mobile. I have also been using an iPad since they were introduced. I have tried using a keyboard with an iPad in the past and the problem was primarily with the keyboards. The reality of using an iPad for data entry and general computing is that the iOS operating system and the apps that have been developed are not all "fully functional" computer programs. In the past, the programs or apps had to accommodate the limited capacity of the tablet computers. Now, the level of sophistication of the tablets, in some limited cases, has reached the "fully functional" computer stage and in fact, some of the applications work better on my new iPad Pro than they do on my iMac. As I am writing this post from my iPad Pro, I find some differences in the standard Apple keyboard and cover and I ordered with the machine. The keys are a little bit stiffer than I am used to, but with a few minutes of use, I am typing along at my normal, fast speed. I am also using the iPad Pro while sitting in an easy chair, looking out at the mountains, rather than stuck at my desk. Normally, with a laptop, I would have a rather heavy weight on my lap and the machine would soon get so hot to be uncomfortable. The iPad Pro is not heavy and it never gets too hot. I also like the fact that the iPad Pro is instantly on. Both my MacBook Pro and iMac take up to five to ten minutes to start up. I can be typing in about 10 seconds with the iPad. What about the functions of the iPad Pro? Word processing i.e. entering text, is exactly the same on the iPad as on my other computers. Copying and pasting is really a different task. Editing the text is a new experience also. I have a whole new set of skills to learn. I purchased the Apple Pencil with the iPad Pro and it turns out to be extremely useful. If I want to insert a screen capture or other image, I will have to learn a whole new sequence of actions. The question I needed to answer before purchasing was how many of these differences exist and were there work-arounds? So far, I am more impressed with the advantages than the limitations. I can do things on the iPad Pro I cannot do on my computer, particularly the drawing options. I still have some issues to resolve, such as showing presentations and other activities I only do from time to time and I will post my comments as I get into those issues. All and all, I am super impressed with the machine and glad I made the decision. It remains to be seen if I will encounter a deal breaker. In the law in the United States, copyright ownership is considered to be personal property, just like a car or any other item the law calls personalty or chattels. In recent developments in the law, copyright and other intangible property has been generally referred to as "intellectual property." The law that has evolved concerning intellectual property is often incorrectly referred to as "intellectual property rights." Unfortunately, the term "rights" has been vastly over-used and over-extended in our system of law to the point that nearly every claim of any interest is also claimed to be a "right." Intellectual property refers to creations of the mind: inventions; literary and artistic works; and symbols, names and images used in commerce. In the legal community intellectual property law represents a very narrow and poorly defined "specialty." Subsequently there are relatively few lawyers who support themselves solely from handling "intellectual property" cases. The most defined area of the intellectual property is patent law and there are a few patent law attorneys in every state, but most are concentrated in the Washington, D. C. area. From an online search it appears that there might be a dozen or so law firms in Utah that advertise that they handle intellectual property cases. In my own experience I was one of only a few attorneys I knew about personally that had actually litigated copyright issues. Most of the online discussion about "copyright" is conducted by people who have never represented clients in a copyright case from start to finish. I have always wanted to ask those who are writing about copyright in the genealogical community if they have ever been personally involved in a copyright case other than one of their own making. It is interesting how many people have an opinion about copyright law with so little background in the subject. Since copyright is a legally defined, personal property interest, it is subject to modification by contract. In other words, you can buy, sell, rent, license and otherwise limit your copyright claim in any way that is allowed by law. The ability to contract away all or part of your copyright is referred to in the law as a right of alienation. You can also lose your copyright interest by ignoring its existence. Ultimately, the only way to protect your copyright interest in the United States is to file a lawsuit in the Federal District Court system. As witnessed by the recent case of the Authors Guild, Inc. v. Google, Inc., copyright litigation can be immensely time consuming and expensive. Just for your interest, here is the complete heading of the Google case. THE AUTHORS GUILD, BETTY MILES, JIM BOUTON, JOSEPH GOULDEN, individually and on behalf of all others similarly situated, Plaintiff-Appellants, HERBERT MITGANG, DANIEL HOFFMAN, individually and on behalf of all others similarly situated, PAUL DICKSON, THE MCGRAW-HILL COMPANIES, INC., PEARSON EDUCATION, INC., SIMON & SCHUSTER, INC., ASSOCIATION OF AMERICAN PUBLISHERS, INC., CANADIAN STANDARD ASSOCIATION, JOHN WILEY & SONS, INC., individually and on behalf of all others similarly situated, Plaintiffs, v. GOOGLE, INC., Defendant-Appellee. Since copyright is a property interest and since it can be alienated in part or in whole, several organized schemes have been developed to regulate the granting of limited copyright interests. The most well-known and used of these schemes is the Creative Commons. This international organization has developed a highly useful and workable way to license copyright interests. From the lack of discussion on this topic, I assume very few of the genealogists who have concerns about their "copyright interests" have studied the alternatives. I seldom see genealogical works licensed under the Creative Commons. I strongly suggest that anyone with a concern about copyright become very familiar with the Creative Commons. Personally, I am very careful to observe the conditions of any of the licenses. The other well-known licensing system is the GNU Operating System sponsored by the Free Software Foundation. Since the GNU Operating System applies primarily to software, it is not usually mentioned in genealogical circles. I am not going to try to explain the limitations or advantages of either system. If you really want to know about copyright, you need to understand the options for licensing. By the way, if you go to an "intellectual property attorney" for advice, you just might want to ask him or her to explain the Creative Commons, if they don't seem to know what you are asking about, you might reconsider their qualifications. Of course, I am not presently, nor do I want to be, a practicing attorney in any state of the United States and everything in this post is my opinion and should not be construed as legal advice for any purpose and you are most welcome to correct or disagree with me anytime. I am perfectly accustomed to being told I am wrong. From the press release announcement entitled "MyHeritage Launches New Community-Powered Q and A Hub," from MyHeritage.com dated 19 April 2016. TEL AVIV, Israel & LEHI, Utah, April 19, 2016 — MyHeritage, the fastest-growing destination for discovering, preserving and sharing family history, announced today the launch of MyHeritage Community, a new online Q&A hub that fosters family history research collaboration. 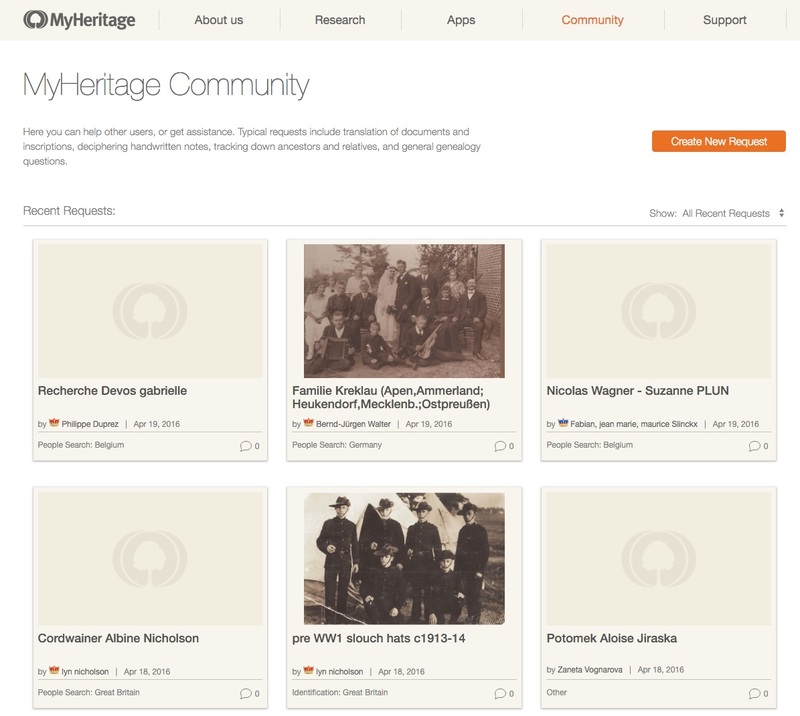 MyHeritage Community is built as an image-oriented forum integrated into the website for users to help one another solve genealogical challenges, such as translating documents, deciphering handwritten letters, identifying unknown people in photos and searching for elusive ancestors. With more than 81 million users around the world registered on MyHeritage and 42 languages supported, MyHeritage Community is uniquely positioned to serve as a meeting place for people trying to solve genealogical mysteries, and other people willing to help them. 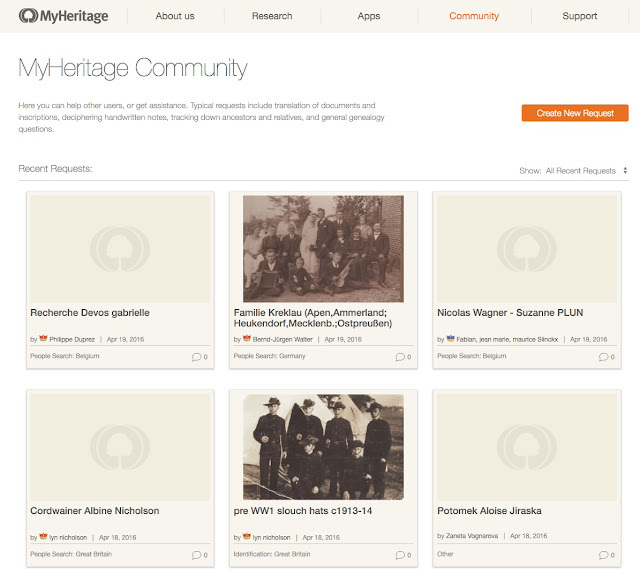 Users looking for assistance can post requests in the MyHeritage Community to get expert genealogy advice or benefit from native language expertise and local geographic familiarity. For example: a user in the United States with roots in Germany can post an image of an ancestor’s handwritten letter written in Kurrent — old German handwriting — and ask for help deciphering it. Another user from Germany can then translate it and add first-hand information on the town from which the letter was posted. This effort is a valuable extension of the genealogical community. As MyHeritage notes in its press release, volunteers are important to the entire community. MyHeritage has lead the way in being directly involved in supporting volunteer efforts in the past through digitizing tens of thousands of grave markers in Israel for BillionGraves.com and in many other projects that do not get generally publicized in the United States. Perhaps some of the other large, online genealogy companies would like to follow suit and become more involved in the community? I can think of several people I know who would greatly benefit from this service. To get started in the MyHeritage Community, follow these steps from the MyHeritage blog post entitled, "Introducing the MyHeritage Community: Receive help or help others." Visit MyHeritage Community. Click "Create New Request". Choose a request type: Translation, identification, meaning of a name, decipher handwriting or people search. If applicable, upload the image of the document or photo for which you need help. Enter a detailed description and click "Submit Request." You will be notified by MyHeritage via email whenever someone responds and posts a comment on your request. All requests will be listed under "Recent Requests," which all other members can see. Your own requests will also be listed at the bottom of the page under the caption "Your Requests" and you can easily access them at any time. We recommend that you write your requests in English because this will maximize the size of the audience who can help you. It's not a must, but it's recommended. Don't worry if you don't receive help quickly; your request will remain on the Community and sooner or later someone may find it and help you. The Supreme Court on April 18, 2016 declined to hear an appeal from the Authors Guild and others who had argued that Google's digital book project was "a brazen violation of copyright law" -- effectively ending the legal battle in Google's favor. See Washington Post, "Google Books just won a decade-long copyright fight." During the long time this case has been pending, Google has consistently prevailed in the lawsuit, winning in the District Court and the Court of Appeals. The ruling by the Supreme Court lets stand the earlier Court of Appeals ruling that Google's massive, online digital book collection is subject to the doctrine of Fair Use. See my previous post, "Federal Court Rules in Favor of Google in Suit by Authors Guild." For genealogists this ruling has ramifications that extend to many online collections of digital documents that may have previously been subject to copyright claims. In the very least, the ruling allows more extensive catalog entries and paves the way for researchers to find more documents online. For nearly three hundred years, since shortly after the birth of copyright in England in 1710,12 courts have recognized that, in certain circumstances, giving authors absolute control over all copying from their works would tend in some circumstances to limit, rather than expand, public knowledge. In the words of Lord Ellenborough, “[W]hile I shall think myself bound to secure every man in the enjoyment of his copy-right, one must not put manacles upon science.” Cary v. Kearsley, 170 Eng. Rep. 679, 681, 4 Esp. 168, 170 (1802). Courts thus developed the doctrine, eventually named fair use, which permits unauthorized copying in some circumstances, so as to further “copyright’s very purpose, ‘[t]o promote the Progress of Science and useful Arts.’” Campbell v. Acuff-Rose Music, Inc., 510 U.S. 569, 575 (1994) (quoting U.S. Const., Art. I, § 8, cl. 8). Although well established in the common law development of copyright, fair use was not recognized in the terms of our statute until the adoption of § 107 in the Copyright Act of 1976. 17 U.S.C. §§ 101 et seq. Fortune magazine gives an interesting assessment with which I tend to agree in an article entitled "Be Glad the Supreme Court Ended the Google Books Case." The reason is that Google’s book scanning has resulted in a rich repository of knowledge that everyone can use. Information that was once locked up in dusty tomes at places like Harvard and Stanford can now be accessed by anyone with a keyboard and an Internet connection. This digital distribution has brought democratization of knowledge, and a wealth of research opportunities for readers and scholars. If the Authors Guild had prevailed, millions of books could have been closed once again, sealed off by a thicket of lawyers demanding permission to peek at any page. I am sure that this ruling will not end copyright issues in the future, but it is a welcome end to one very longstanding controversy. The real issue hear is the ability of authors to benefit from Google and other online methods of publicizing their works, without paying the publishers. Here is another comment from the Fortune magazine article. Finally, note that many authors never agreed with the Authors Guild’s lawsuit in the first place. These writers have claimed, correctly, that the Google scanning has saved many books from obscurity. What good is an out-of-print book sitting in an out-of-the-way library where no one can read it? I recently began an in-depth study of DNA testing as it relates to determinations of ancestral relationships. I have found a close analogy between the life insurance industry and the relatively recent ancestral DNA industry. Both represent their products as solutions to rather general problems. I do not want to give specific examples that identify providers, because the issue is one of general application to all of the providers. My analogy does not work with liability or health insurance, but only with life insurance. I am looking at an ad for life insurance that reads, "Now is the time to take another look at your life insurance." Implicit in this ad is the assumption that the reader of the ad already has life insurance. When I was much younger, with my children at home, I was the target of a number of very persuasive life insurance salesmen and I bought and maintained a series of life insurance policies. As I gained an increased level of sophistication from my law practice and involvement in various business ventures, I realized that life insurances was not something that everyone needed. life Insurance policies also varied considerably in their cost and application. At one point, to further my education, I obtained a license to sell life insurance and was affiliated with a national life insurance company. Basically I learned all the reasons why life insurance was not a solution to the standard problems proposed by the salespeople. I also learned all the limitations and reasons why someone might not need life insurance. As a result of my legal training, I felt duty bound to explain to any potential purchaser of life insurance why they may not need the product. This is not a good way to sell life insurance. I don't remember ever selling even one life insurance policy. Now I find myself hearing very similar advertising pitches from DNA companies. As I have mentioned before I once again find myself in the position of hearing product claims that superficially seem beneficial but appear to apply to only very specific situations. The life insurance analogy becomes stronger the more I learn about DNA testing. Essentially, ancestral DNA testing is justified as a way to "get people interested in their ancestry." Potential users are encouraged to learn what percentage of their DNA comes from populations around the world. Examples are given of unknown family members reunited and other "success" stories. The DNA literature immediately launches off into a technical discussion of the "hard science" involved in the process. The reality is that DNA testing becomes less specific as you go back in time. My own family tree is not a "standard" example. I have solid, extensively documented evidence of my ancestry back at least six generations on every line. As I have expressed previously, there are now some very specific issues that might be resolved with DNA testing, but a solution would require some confirming tests from a variety of relatives that may or may not be available. Even it we were to obtain the cooperation of my relatives (not at all likely in many cases) there is no way DNA testing per se can provide a solution. The only benefit derived from the DNA tests would be additional information on lines that have been extensively researched. So I am back to the life insurance analogy. Life insurance is a product that can solve some very specific problems. But unless the problem and the needed solution are well researched and analyzed, simply purchasing a general life insurance policy will not necessarily solve a specific need. It is the same with DNA testing. Before I jump into the fray, I realize I need to do some very specific research to define the problems I want to resolve. 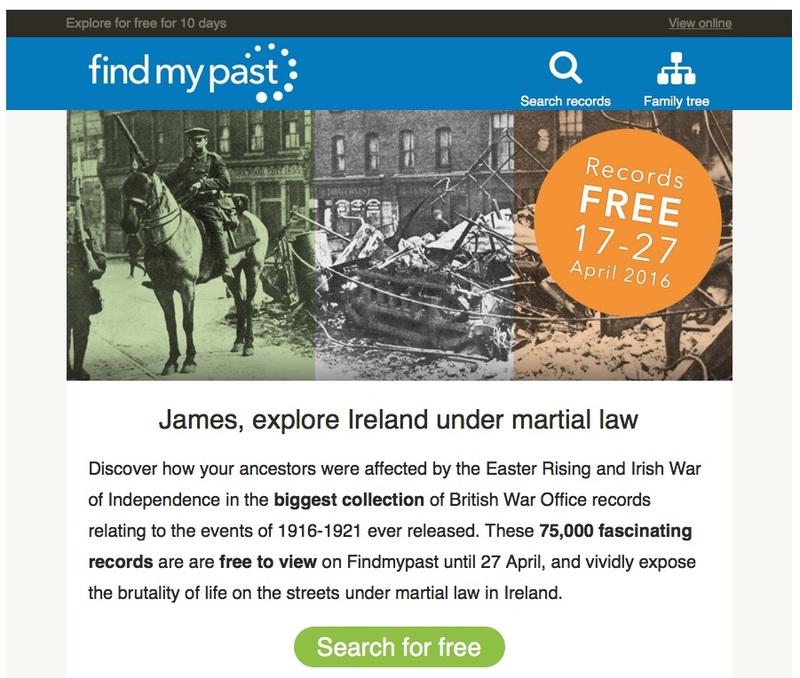 Until April 27, 2016, you can view 75,000 British War Office records of the Easter Rising and the Irish War of Independence for free on Findmypast.com. The website also has over 10 million free Irish Catholic Parish records. The Easter Rising (Irish: Éirí Amach na Cásca) was the most significant armed action since the rebellion of 1798. Here are some websites that will give the history and background of the Easter Rising and the subsequent War of Independence. Augusteijn, Joost. From Public Defiance to Guerrilla Warfare: The Experience of Ordinary Volunteers in the Irish War of Independence, 1916-1921. Dublin: Irish Academic Press, 1996. Brennan, Michael. The War in Clare, 1911-1921: Personal Memoirs of the Irish War of Independence. Dublin: Four Courts Press : Irish Academic Press, 1980. Coogan, Tim Pat, and Rogers D. Spotswood Collection. 1916: The Easter Rising. London: Cassell, 2001. Easter Rising. Left Field Media, 2011. “Easter Rising.” Wikipedia, the Free Encyclopedia, April 15, 2016. https://en.wikipedia.org/w/index.php?title=Easter_Rising&oldid=715454029. “Easter Rising | Irish History | Britannica.com.” Accessed April 18, 2016. http://www.britannica.com/event/Easter-Rising. Edwards, Owen Dudley, and Fergus Pyle. 1916: The Easter Rising; London: MacGibbon & Kee, 1968. Foy, Michael, and Brian Barton. The Easter Rising. Stroud, Gloucestershire: Sutton, 1999. Harris, Nathaniel. The Easter Rising. London: Dryad, 1987. Hopkinson, Michael. The Irish War of Independence. Montreal; Ithaca: McGill-Queen’s University Press, 2002. “Irish War of Independence.” Wikipedia, the Free Encyclopedia, April 14, 2016. https://en.wikipedia.org/w/index.php?title=Irish_War_of_Independence&oldid=715157795. Kautt, William H. Ground Truths: British Army Operations in the Irish War of Independence, 2014. http://search.ebscohost.com/login.aspx?direct=true&scope=site&db=nlebk&db=nlabk&AN=753858. Killeen, Richard. The Easter Rising. New York: Thomson Learning, 1995. Leeson, David. The Black and Tans: British Police and Auxiliaries in the Irish War of Independence, 1920-1921. Oxford: Oxford University Press, 2011. Martin, F. X. Leaders and Men of the Easter Rising: Dublin 1916. Ithaca, N.Y.: Cornell University Press, 1967. McKenna, Joseph. Guerrilla Warfare in the Irish War of Independence, 1919-1921. Jefferson, N.C.: McFarland & Co., 2011. Moran, Seán Farrell. Patrick Pearse and the Politics of Redemption: The Mind of the Easter Rising, 1916. Washington, D.C.: Catholic University of America Press, 1994. http://search.ebscohost.com/login.aspx?direct=true&scope=site&db=nlebk&db=nlabk&AN=46441. Moylan, Seán, and Aubane Historical Society. Seán Moylan, in His Own Words: His Memoir of the Irish War of Independence, with a Selection of Speeches and Poems. Aubane, Millstreet, Co. Cork: Aubane Historical Society, 2004. O’Farrell, Padraic. Who’s Who in the Irish War of Independence, 1916-1921. Dublin: Mercier Press, 1980. ———. Who’s Who in the Irish War of Independence and Civil War, 1916-1923. Dublin: Lilliput Press, 1997. Sheehan, William. British Voices from the Irish War of Independence 1918-1921: The Words of British Servicemen Who Were There. Doughcloyne, Wilton, Cork: Collins Press, 2005. Trotsky, Leon, and Revolutionary Communist League. The Easter Rising. [London]: [Revolutionary Communist League], 1970. Ward, Alan J. The Easter Rising: Revolution and Irish Nationalism. Arlington Heights, Ill.: AHM Pub. Corp., 1980.